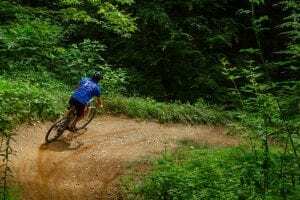 Mountain biking in Gatlinburg is one of the most exhilarating ways to enjoy the great outdoors. If you’re new to the sport and aren’t exactly sure what to wear, don’t worry! To help you prepare, here are a few items of clothing and gear to consider bringing when you go riding. Whether you’re just starting out or have been mountain biking in Gatlinburg for a while now, accidents happen! If you take a tumble off your bike, the right gear can protect you from all kinds of injuries. Your helmet is the most important piece of protective gear by far! There are a variety of different helmet styles based on the type of mountain biking that you do. However, no matter which one you choose, it’s infinitely better than having no helmet at all. It’s also smart to invest in a pair of kneepads if you plan to get into more extreme styles of riding. The main thing to remember about tops when you’re mountain biking is that they should be made of flexible and breathable material. Nylon and polyester are both great materials to look for in biking shirts. You can count on sweating a lot, so you should try to stay away from cotton if you can help it because you’ll feel damp and uncomfortable. It’s also a good idea to look into buying a weatherproof jacket so that if you run into wet or chilly weather, you’ll be protected. When it comes to bottoms, a good pair of off-road riding shorts can greatly increase your comfort! There are a few different options available depending on the type of riding you’re planning on doing. Form-fitting lycra shorts are typically favored among cross country riders while trail riders usually like to wear shorts that are slightly baggier and vary in length. It’s also common to see mountain bikers wearing shorts with padding. The shape and thickness of the padding all comes down to personal preference. While tennis shoes can be worn when you mountain bike, a more ideal option are those made specifically for the sport. Mountain biking shoes are a lot stiffer and more durable than your average pair of sneakers. They help to protect your feet from rocks and roots along trails. These shoes also give you a better grip on the pedals. This is beneficial because it’s far less likely you lose your footing when you’re riding downhill or on more technical terrain. There are so many things to love about mountain biking in the Smokies, especially when you visit CLIMB Works! Our trail is perfect for beginners and experts alike because it can be as easy or as challenging as you choose to make it. If you don’t feel like loading and unloading your bike from home, you can even rent one while you’re with us! Now that you know what to wear when you go mountain biking in Gatlinburg, it’s time to plan your visit! Be sure to book your adventure at CLIMB Works today so you can start looking forward to the ride of your life!